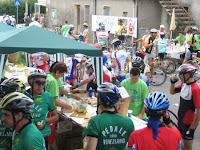 The feed station after Passo San Boldo was thankfully well stocked with food and drink. It was good to see passers-by just hanging around chatting to the riders and giving us tips on what to expect on the road ahead. "Take it easy now," one guy said. "In the next hour you will be working very hard." I had been warned ! Once I'd wolfed down some banana, Sali (Italian brand of energy drink) plus some Gatorade I was on my way - not forgetting the need to pace myself. For all the gran fondo events that take place in Italy I get surprised at the number of Italian riders that don't climb well - on the flat or going downhill, boy they're fast movers ! But any reading on the altimetre, and that's a different story. That must be the Mario Cipollini effect ! And so it was that I was very quickly dropped after the feed station when the guys hurtled down the hill, and I was practically left standing ! I tried to follow them, but I had neither the technique nor the balls to go so fast. I rolled down the road as fast as I could while keeping them in my sights. To my surprise, I managed to catch them on the flat. I'd like to think that it was down to my sprinting ability, but it was actually because they'd slowed down to wait for me. That made me feel just as good though ! I didn't know them, but I think they just wanted to "look after" a young lady riding on her own ! 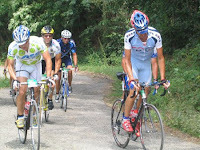 We all rode as a group and I took shelter from the big men in front. Of course this didn't last long as the pleasant trip along the valley floor soon ended when we turned left to start the climb up to Nevegal ski station. This climb would average 8% and last around 7 miles. The first 2 miles were a shock to the system. A young woman from San Francisco I'd passed just after the San Boldo feed-station came bounding up the hill past our group. She said that back home all she does is ride uphill - she was certainly at home on this climb ! I tried to keep her in my sights, but given how hot it was getting and the long road that lay ahead, I decided to spare the heroics. After a a couple of miles the road levelled off and we had a few sections of downhill. We were also treated to shaded areas as we passed through the woods. The only problem was that most of these sections were on dirt tracks. "This is like Cyclo cross" - I said to a fellow competitor. "No, this is Eroica" he replied. He seemed to enjoy riding this section that is akin to the vintage cyclosportive that recaptures the spirit of bike racing in the 1920's. 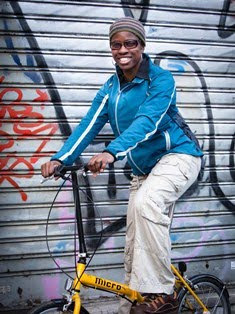 I was more concerned about not falling over when riding over a pot hole. At least I was riding on a new set of tyres ! The dirt track continued for around 3 miles. Then the final 2 miles kicked up again. The gradient increased to around 10% and we once again exercised our quad muscles. I felt spurred on at the sight of the feed station above, and the knowledge that we would soon be doing a U-turn to start a big descent back towards Treviso.